It’s been a long time since we’ve had a good debunking-random-monster-sighting post. The ready availability of global satellite image databases is a powerful tool for exploration and monitoring but has also led to a boom in pseudoscience “discoveries” by people not familiar with how these images are produced or just willing to suspend disbelief for their pet woo. Satellite images aren’t taken in real time. The photographs in question were taken in January, 2005. They came from DigitalGlobe, which means they were either taken by the QuickBird satellite, or purchased from another company. Satellites travel along an orbital path, taking pictures that are then stitched together. Just like when you take a panoramic picture with your phone. Stitched photos aren’t perfect. 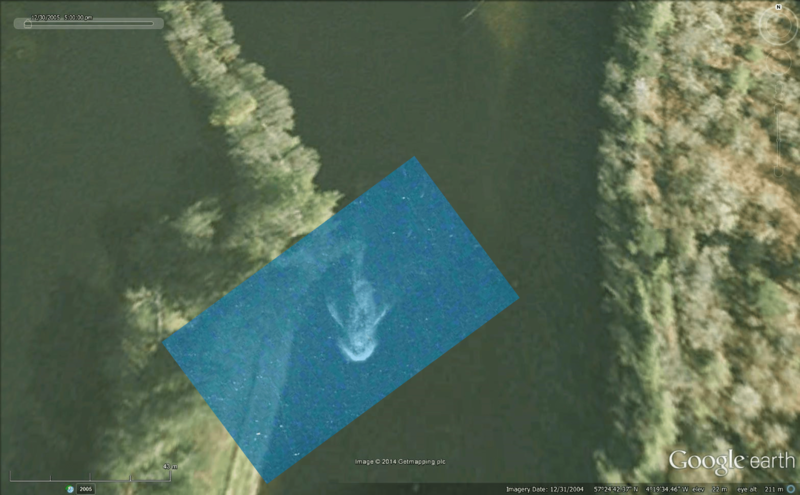 For example, if one picture has a boat that’s totally washed out (like almost every boat is when photographed from space) and another picture is just blue water, then you’ll be left with the ghostly blue outline of a boat, which is clearly visible on the “Nessie” picture. Apple doesn’t have it’s own imaging satellites. The fact that the image only shows up in Apple Maps, not Google, is due to Apple either using a slightly different image set to stitch together a picture of the loch, or has a less robust algorithm for dealing with artifacts. Both the boat in the northern picture and the “ghost boat” in the monster picture are about 20 meters long. There are no 20-meter long catfish. There are no whale sharks in Loch Ness (how would they survive in freshwater?). It’s a boat. If something looks exactly like a boat wake, in a place where there are plenty of boats, when a similar boat can actually be seen in the same region, it’s a boat. Update 3: Mick West shared these two images on twitter, further supporting the fact that this is just a boat wake and some satellite image bonkery. It’s obviously the wake from Wonder Woman’s invisible speedboat. I would like to know: Why would the boat making the wake be invisible in the Loch Ness photo, but visible in the photo you provided for comparison? It’s not “invisible” it’s just a low resolution satellite image. Its got nothing to do with the resolution. Its yhe way the images are over layed and then displayed. The program creates the best rendering of the two over layed images which is why the boat is “invisible”. It’s not the resolution. The other (much smaller) boats in the Apple Maps are bright white like the boats on the Google Maps. Maybe the there’s an overlapping image edge there and a semi-translucent layer of blue water is covering it so only the brightest parts of the boat & wake show through? Not that I believe they found the monster but the “overlay” seems a bit disingenuous. Perhaps showing the pictures with and without the overlay at the same scale might make it a bit more believable. Really, I’m not trying to discredit the author or anything, but this just appears to be somebody pasting the Loch Ness pic on top of another and hoping people just skim the article and say “Oh see, its a hoax!” Having looked at a lot of GIS aerials daily for years, I have seen a lot of comparisons, and frankly, to me the picture from the Loch really does not look quite the same as a boat wake. Pasting the overlay on top just gives that illusion. Very clever, gota love science :). Now that makes your case much clearer (No pun intended). That I’ll believe. You can see that the geometry lines up pretty well. The lack of contrast between the two items in the Loch picture would appear to be from atmospheric haze, which washes out the difference in color at a distance. (Much like when you look at a plane in the sky and it appears almost transparent because you are looking through a lot of that blue sky) Thanks much. I find this quite interesting not because of Nessie but because of the sattelite image taken slightly after the apple maps one. Where did you get this? It seems it’s the google maps equivalent – could you post the coordinates of the second boat gif? If it’s a boat wake, where the hell is the boat? The wake could just as easily be made by something below the surface. You ever seen a dolphin or whale rushing under the surface? They make a wake on top of the water just like that. Not saying I believe this is a an aquatic monster, but your theory still hasn’t debunked anything. All you’ve stated is that it’s a wake, which can be made by anything in the water, animal or machine. Check the update. The boat is there. I don’t believe you. I think that is a picture of the Loch Ness Monster and am willing to spend millions of dollars and thousands of hours funding and researching the area to prove it. The day has finally come; viva la Nessy!!! I second what Andrew said. A wake will always look like a wake, whether its make by a boat or a dolphin or Nessie. I’m not claiming the existence of Nessie, just trying to follow the logic of this post…Yet I’m still confused as to why the boat that supposedly produced the wake in the Apple Maps image is pictured in the photo you provide in your GIF, but not in the original satellite photo from Apple Maps? http://www.unmuseum.org/nesshoax.htm can we also talk about how the original image was a hoax, done to get back at the daily mail? I’m no expert, but even I could see the outline of the boat washed out of the original “Nessie” pic. I would love to find real proof of Nessie, but this isn’t it. People will see what they want to see, in many cases beyond reason. Please see and understand Occam’s razor. If we have a reasonable explanation of the image we don’t need the incredibly fantastic monster explanation. Think about it. If we discard the boat explanation and go with the monster explanation we are suddenly presented with numerous problems to explain which are much more difficult to explain than a washed out image of a boat. Sure, looking at several images of boat wakes that match this image precisely doesn’t PROVE this is a boat but it sure as day doesn’t prove this is a monster. To suggest this image is a monster is falling for a well known logical fallacy known as an “argument from ignorance”. Further …when I saw this story was being propagated the muck raking sensationalists at the Daily Mail my heart sank because that already tells me most of what need to know. 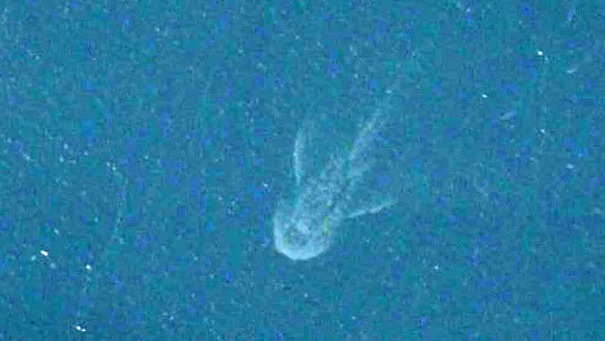 There is a very similar image on Apple earth / Loch Ness northeast of Urqhuart Castle. 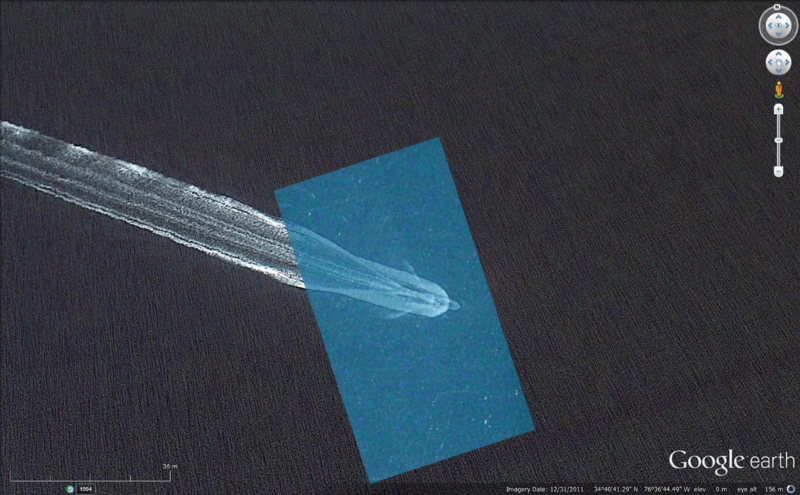 It is clearly a boat but unlike the controversial image it is not overlaid with haze. I have to say quite frankly, I am 100% certain that us NOT a boat wake, period. I’ve been imaging the effects of in board and out board flows as an engineer for years, and if this were a boat wake, it would be the shortest trail I have NEVER seen from that size of a head dispersement in the bow. I am not saying its Nessie by any means, but absolutely not a boat. Sorry Thaler, but you need to consult an expert on wake dispersement buddy. Maybe it is Nessie she just has deck chairs and a bow. Sea monsters are very sneaky that way. 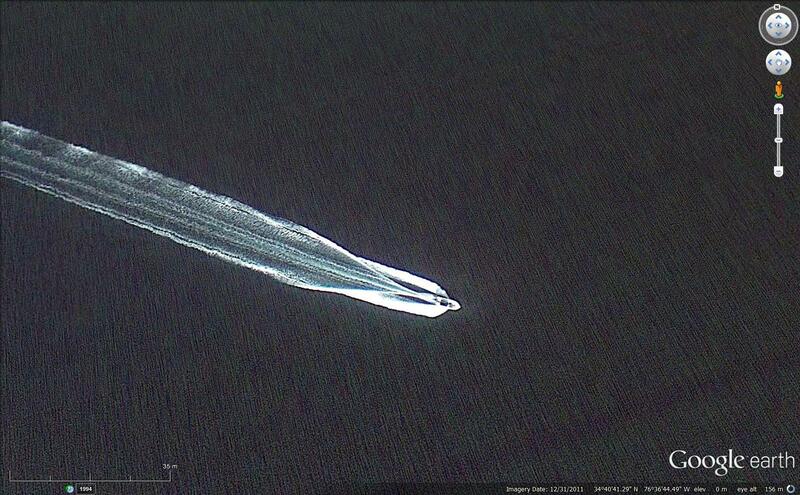 I found it on google earth and the boat is clearly visible. Just search Loch Ness and zoom in and move towards the north of the loch. Hard to argue with pictures. yeah I know I am not helping. You could clearly see the rectangular outline of an object (the boat) in the middle of what looked strikingly like a huge whale shark, before anybody started debunking or presenting other images that clearly showed the same boat shortly before this image was taken. Even so, the gif is extremely helpful and eliminates ANY doubt. Anybody still not convinced that it’s a boat, is obviously someone that believes in Bigfoot and that aliens are living amongst us. You will never convince them otherwise, no matter what you do, say, or show them. Apparently everybody also missed that the guy who started the whole Lochness monster myth, with the classic grainy b&w photo of the head, admitted on his DEATH BED that he faked the picture and that it was a hoax. Like I said though, none of that will matter to the “believers”. I firmly believed that it was a boat before I came to this site’s article and photos. Now the “real evidence” debunking the photo has actually caused me to have second thoughts. I wish I didn’t have to agree that it is a boat. But it is a boat.